A good variety, a good price, and a good meal are what you’ll find at Paradise Garden Buffet in the Flamingo. With a spectacular view overlooking the gardens and 15 acre wildlife habitat, you can enjoy a wonderful brunch daily and dinner Friday and Saturday nights. 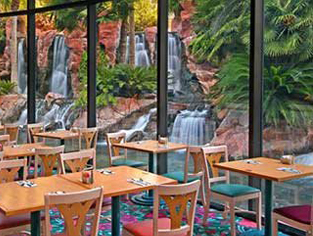 A daily brunch buffet is offered at the Paradise Garden buffet. Enjoy breakfast, lunch or brunch selections at stations throughout the room. Particularly popular with the adults is the build-your-own Bloody Mary and mimosa bar; for the kids the top choice is the build-your-own yogurt parfait bar. Breakfast items include southern and Mexican influenced dishes, breakfast sandwiches, waffles and pancakes. Lunch consists of burgers, BBQ, brick oven pizza, deli sandwiches and a salad bar. Leave room for the dessert bar, crepes and a chocolate fountain. Beer, wine and champagne are also inclusive. A dinner buffet is available Friday and Saturday from 5 pm – 10 pm. The dinner includes prime rib, crab legs and peel and eat shrimp for $29.99. The gorgeous windows with views of the gardens filled with flamingos, birds and ducks make this a beautiful place to linger over your selections. If you want a true retro experience here it is. The roast was great, the desserts reminiscent and the decor pure 80′s. The treasure was however the staff. Joyfully charring to older customers, making a great fuss of the family with the new baby. They love their work and it shows. We at at this buffet a couple of times during our time in Vegas and didn’t mine it! We always found something g we wanted to eat and always left full for the day of site seeing. I would suggest going about ten minutes to the lunch change over tho cuz you get the best of both meals. With so many other buffets in Vegas, why eat here. My wife and I were unhappy with the food. Nice place to sit and look out to the garden and pool of fish, but honestly, the food was low grade. Will not go back. I’m only giving one star because I can’t leave zero. We came for lunch and it was terrible. Don’t waste your money. Go anywhere else.